Ok, at this point I think its fair to say that I’m mildly obsessed with Bobby Kennedy. I’ve written about some of the reasons why, including this speech I wish could be given today and his incredible Ripples of Hope speech, but the main gist is that he inspires me to want to be a better person and to continue to realize the many gifts I’ve been given compared to most. I believe, like Bobby, that at the very core of humanity is the belief that you look out for your fellow man and when possible, raise them up. The best book I’ve read so far on Bobby is Bobby Kennedy: The Making of a Liberal Icon. That book first opened my eyes to Bobby’s journey and I thought it did a fantastic job of walking the reader through his life. The Revolution is very solid, but didn’t live up to that first one. A groundbreaking account of how Robert F. Kennedy transformed horror into hope between 1963 and 1966. On November 22nd, 1963, Bobby Kennedy received a phone call that altered his life forever. The president, his brother, had been shot. JFK would not survive. 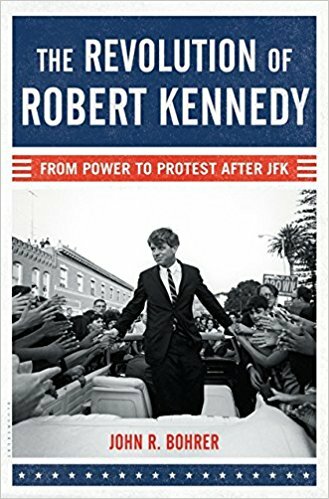 In The Revolution of Robert Kennedy, journalist John R. Bohrer focuses in intimate and revealing detail on Bobby Kennedy’s life during the three years following JFK’s assassination. Torn between mourning the past and plotting his future, Bobby was placed in a sudden competition with his political enemy, Lyndon Johnson, for control of the Democratic Party. No longer the president’s closest advisor, Bobby struggled to find his place within the Johnson administration, eventually deciding to leave his Cabinet post to run for the U.S. Senate, and establish an independent identity. Those overlooked years of change, from hardline Attorney General to champion of the common man, helped him develop the themes of his eventual presidential campaign. The Revolution of Robert Kennedy follows him on the journey from memorializing his brother’s legacy to defining his own. John R. Bohrer’s rich, insightful portrait of Robert Kennedy is biography at its best–inviting readers into the mind and heart of one of America’s great leaders.